Posted on 11/15/2013 by Stand and face the sun. Runners tend to gravitate towards my classes and teaching style, for one main reason : I don’t chastise them for being runners. If anything, I praise them for it and ask them when their next race is. I also incorporate a lot of great poses that deal with runner specific over-use injuries. But I also don’t sugar coat it with runners. The truth is, running will not make your physical practice of asana better, but yoga will definitely make your running better, physically speaking. As long as runners can make peace with that idea, it will make it a whole lot easier to push through 1st series ashtanga yoga for 90 minutes. You are bound to be tight, but without yoga you will only get tighter and probably experience more injuries that will sideline you. So my comparing 90 mins of ashtanga yoga to 90 minutes of running was to make the point that they both take about the same amount of time to accomplish, and that during both you will have to overcome the quitter’s mind. That during 90 minutes of either activity you are probably going to wonder “What was I thinking to do 90 minutes of yoga/running.” Something is going to hurt, some posture, or mile is going to be brutal, and you might start to lose your motivation. When doing anything physical you are going to run up against that voice in your head that is the pessimist, the nay-sayer, the weakling. This is where running and yoga are similar. They are both a battle of the mind, more than a battle of the body. Your body can do just about anything. Hence the reason why the New York City Marathon has 50,000 competitors , the Marine Corp has 30,000 and the Chicago marathon has 40,000, just to name a few. 1% of those people are competing against each other, while the other 99% are competing against the weakest version of their self. The nay-sayer voice that around mile 16 loves to tell you, “You can’t do it.”, is the same voice in yoga that will try to tell you you can’t come up out of a backbend either. The voice is the same, it comes from the same place and can be put to rest the same way no matter if it’s running or yoga. As my teacher, Tim Miller, likes to say “Experience is the remover of doubt.” Every time I run 5 miles, it erases the doubt that I can’t run 6. Every time I run 6, it erases the doubt that I can’t do 7. This can carry on until the 26th mile is finished. This is how I see the similarities between running 9 miles and ashtanga yoga; the surya namaskars are equivalent to the first mile of any run you go on. It’s the warm up mile, where you find your legs and the rhythm of your breathing. The standing poses are equivalent to a 5k (3 miles), it’s enough of a run on a busy day. The seated postures, up to Marichyasana are equal to about 5 miles. Right in the heart of what are commonly called the speed pump poses in ashtanga there is navasana, bhujapidasana, kurmasana. These are like mile 6, where you start second guessing yourself, and this crazy idea of staying fit. Mile 7 of a 9 mile run starts to smooth out just a bit as you start thinking you’re in the home stretch. Just like the poses baddha konasana, upavishta konasana, and supta padangsthasana do in yoga. You might think backbends are mile 9, but they are only mile 8, you must save enough energy after backbends to complete your inversions and come in strong to savasana. Savasana is equivalent to the cool down after a long run. I can tell you from experience, you don’t just sit down after a long run, or you will quickly stiffen up. You will struggle just to get your shoes off later, if you don’t incorporate a good cool down. Savasana is necessary and so is a good cool down walk after a long run. 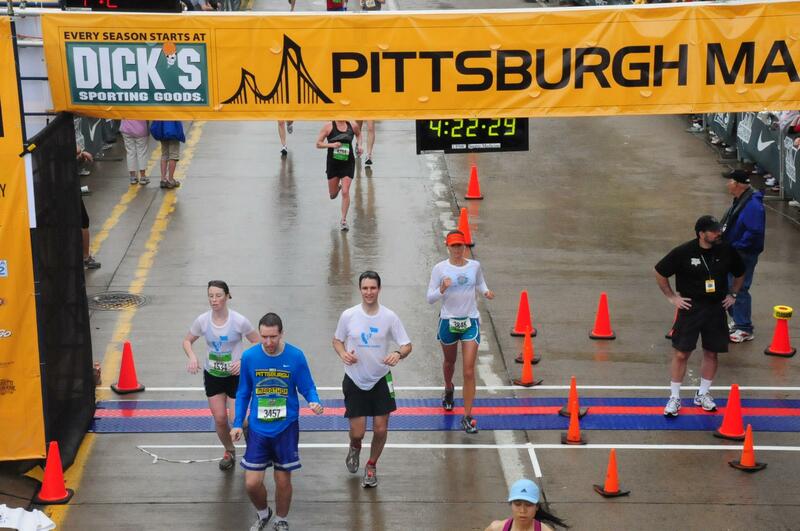 Around mile 19 of the Pittsburgh Marathon. I think this is why for years now I have loved practicing ashtanga yoga, and I continue to be a runner. 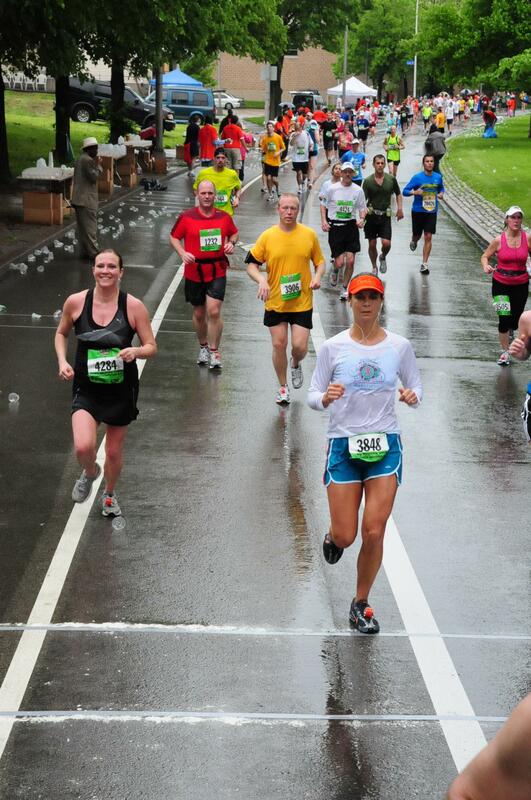 I was a runner long before I was a yogi – I am a distance runner at heart. I like the rhythm of my breathing, I like the rhythm of my legs and arms working together, and I love how my pessimistic mind doesn’t win out. Most runs and most yoga practices I conquer my negativity. I push through the rough spots and I always come out on the other end better for it. Running may be making my yoga practice harder, tighter, but I know that what I conquer while running makes me a better yogi in mental capacity. While yoga makes me a better runner in physical capacity. There is no doubt in my mind that they both make me better spiritually. Staring down your weakness has a profound way of changing you. Not once in 4 marathons have I hit the infamous “wall” (Mile 21), which in no way means I’m discrediting it. I just happen to run slow enough and have conditioned my mind enough into an “I can” attitude over “I can’t.” Plus to be honest I haven’t run a single marathon trying to beat another person, or a previous time. Simply put, I run them just for the sake of finishing and for once more tackling my inner demons that love to tell me “No”. I remove my doubts by doing the things that I thought couldn’t be done. So if you’re a runner and haven’t yet tried yoga, I strongly advise you do. Now! Put on your running shoes and head straight over to a studio near you. If you can, find Ashtanga yoga. I think you will like the similarities I just mentioned. I am not telling you it will be easy. I’m being completely honest telling you it’s hard. Running tightens you, it’s gonna be brutal, but it will save you from injuries and even burn-out. It will also give your running longevity. I foresee myself being a runner for just as long as I am a yogi. This is good place to insert my favorite Forrest Gump quote and no it’s not “Run Forest, Run.”, it’s “We was like peas and carrots.” For me, yoga is the peas and running is the carrots. Let’s see if this works “Do yoga, Forest, do yoga!” Nope, it doesn’t work, but I hope I have made my point. Agni Stambhasana (Fire log pose)- for the glutes and IT band. Urdhva Dhanurasana (Upward bow pose)- for the whole front body. Modify it by lying over a stability ball – it is just as good for you.